Drew Dellinger, Ph.D is an internationally sought-after speaker, poet, writer, and teacher who has inspired minds and hearts around the world, performing poetry and keynoting on justice, ecology, cosmology, and compassion. Dellinger holds a Ph.D. in Philosophy and Religion from CIIS, and has taught and lectured at numerous colleges and universities including John F. Kennedy University, where he was Associate Professor and Director of the Program in Social Ecology. 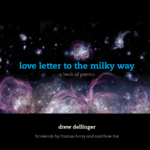 Dellinger’s poetry reaches out to the far ends of the Milky Way and to the inner depths of the soul. His poetry and performances have captivated thousands across six continents. His poems, in the words of Paul Hawken, “are bodies of light seen by startled eyes, and long after he speaks they weave the unconscious, stitching us to our collective and uncertain future.” This power of his poetry is tied to his passion for ecological survival and social justice movements. Dellinger has presented at over 1,000 events across the U.S., U.K., Canada, and Australia. He has spoken and performed at numerous conferences-—including Bioneers, the Green Festival, the Dream Reborn, and the Parliament of the World’s Religions—as well as colleges and universities, poetry venues, protests, and places of worship. He has shared podiums and stages with luminaries such as Alice Walker, Cornel West, Thomas Berry, Danny Glover, Julia Butterfly Hill, Brian Swimme, Paul Hawken, Ani Difranco, Chuck D, Eve Ensler, and many others. Dellinger’s work has appeared in films, books, anthologies and magazines—from The New York Times magazine to YES!, Tikkun, Kosmos, and others. Dellinger’s poems have been cited and quoted in venues ranging from prison workshops to climate change hearings before the U.S. Congress. Dellinger co-wrote the documentary film, The Awakening Universe, which premiered at the United Nations.